In a food processor, process Tam Tams, butter and sugar to make crust, until very fine and well combined. Spray a mini muffin with non-stick spray. Place a heaping teaspoon of the crust into each muffin spot, and push down with your finger to make the crust. It’s okay if the crust comes up on the sides a bit. Meanwhile, make the filling. Place all the ingredients in a large bowl, and beat with a hand beater or use a stand mixer until very well mixed and stiff peaks have formed, about 5 minutes. Scoop the filling evenly into the muffin tins out of the freezer, smoothing out the top. Freeze for 2 more hours, or until set. While they are setting, make the raspberry sauce. In a small saucepan, combine frozen raspberries, ¼ cup water and sugar. Bring to a boil, and lower to a simmer. Simmer for 5 minutes, until raspberries are cooked down. Use a mesh strained to strain seeds out of the sauce, and put it back in the washed out saucepan. In a small cup, whisk cornstarch and 1 tablespoon water together and add to the raspberry sauce. Simmer until thick enough to coat the back of a spoon, and let cool. Add more water if it gets too thick. Take the cheesecakes out of the freezer and let come to room temperature for a minute or two. Top with a dollop of raspberry sauce, and serve immediately. Store leftover cheesecakes in the freezer until ready to serve. 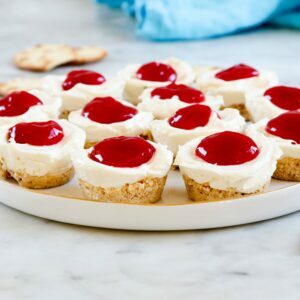 Make ahead: Cheesecakes and Raspberry Sauce can be made up to 5 days before serving. Keep cheesecakes frozen until ready to serve, dollop raspberry sauce right before serving.